2 1/2 pounds sunchokes, peeled and cut into 1/2 inch pieces. 1. In a large saucepan, cover sunchokes with water and add a pinch of salt. Boil 10 minutes or until tender. Drain and set aside. 2. Fill the large saucepan with water and bring to a boil. Add kale and cook until tender (~3 minutes). Drain kale and let it cool slightly, squeeze out any excess liquid from the leaves. 3. In a small skillet heat 2 Tbsp. of the blended oil. Add onion, garlic, and a pinch of salt. Cook over moderately low heat until browned (~12 minutes). 4. In the large ceramic skillet, melt 1 Tbsp. butter in 2 Tbsp. oil and distribute sunchokes in an even layer. Cook over high heat until browned on the bottom (~3 minutes). Turn the sunchokes, reduce heat to medium-high and continue cooking until they begin to brown (~2 minutes). 5. Push sunchokes to the side of skillet, add 1 Tbsp. oil and oyster mushrooms. Season with salt & pepper and cook over moderately high heat until browned (~ 3 minutes). Add remaining Tbsp. 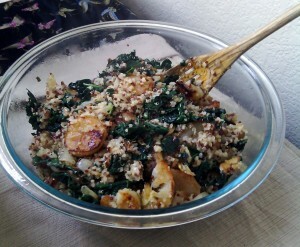 of oil along with quinoa, onion, garlic, and kale and cook, stirring, until hot. 6. Season with salt & pepper and serve.